Where Could Housing Bubble Burst? The boom in property values continues to grow with the median price of an existing home rising 10 percent in the last year. But could this spell trouble for the real estate industry? Some analysts are predicting that the bubble is about to burst. A big trend is buying homes as investments; many are doing it on speculation. Looking at such factors such as population trends, an area's affordability index, and job growth, Kiplinger's Personal Finance magazine came up with a list of the riskiest housing markets in the nation. 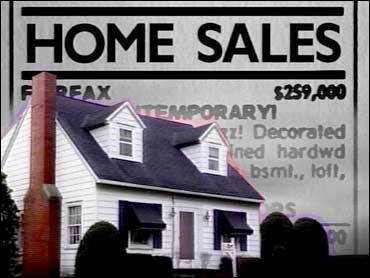 The magazine's Vera Gibbons tells The Early Show co-anchor Harry Smith a good indicator of a risky housing market is income that does not keep pace with housing prices. "Some places are becoming unaffordable in large part because incomes aren't rising the same way that housing prices are," Gibbons explains. New England Area – Boston, Mass., is the riskiest housing market in nation with a 53 percent probability that housing prices in the area will decline over next two years. Loss of jobs and affordability problems make Boston so risky. And the area is saturated; there's not much new housing stock coming in. Also, Providence, R.I., is facing the same issues as Boston. There's no population growth and job growth is stagnant. The risk of price decline in Providence is 39 percent. The Northeast - New York City has a 31 percent probability that prices will decline. During the housing slump in the '90s, job losses were the big problem. Now, it is the baby boomers who are moving out of the city. And if that trend continues, the high-end real estate market will take a hit. In Washington, D.C., where government spending, and the resulting strong job market, has fueled the boom, home prices have risen 23 percent over the past year. There's a 19 percent chance that prices will slump as the government reins in spending. South To Florida - Fort Lauderdale is an area where there's been a lot of speculative buying, and that always raises the risk. Retirees, who are the traditional buyers of property in Fort Lauderdale, may be priced out of the market. Miami, where prices have risen 28 percent over the past year, is also vulnerable to a price decline. But because tourism, services trade and transportation remain stronger, Miami is less of a risk than Fort Lauderdale. And in the Tampa and St. Petersburg area, prices haven't risen as much, making it a safer choice. The median price of a home there has jumped 16 percent over the past year, and the risk of a housing slump is at 14 percent. The West Coast - If you thought real estate was expensive in New York, take a look at some of the property listings in San Francisco, where the median home price is $689,000, the highest in the nation. The high prices of land and tough restrictions on what may be built contribute to that city's 40 percent risk of price decline in the next two years. Also, affordability is the key issue in Sacramento, where prices have climbed 27 percent in the last year. And in Los Angeles, a lot of people are playing the real estate game, buying on speculation, which raises the risk factor. Other Areas - Detroit - Home values in the area rose less than 1 percent over the last year, to a median value of $151,000. Here, it's all about jobs - at the struggling automakers, in particular. General Motors announced in early June that it is going to eliminate 25,000 jobs by 2007; Ford is also struggling. So with job growth in Detroit flat to negative, the prospects for housing look weak. It's the same type of situation in the Minneapolis and St. Paul area as in Detroit. Northwest Airlines, a major employer in the area, is having problems, and that affects the housing market. In Denver, a concentration of employers in the troubled telecom sector leads to a risk of a home-price downturn.